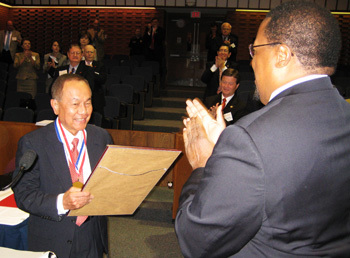 Rolando V. del Carmen is presented a resolution honoring him as a "regents' professor." Applauding is board of regents member Bernie Francis. Rolando V. del Carmen, distinguished professor of criminal justice and one of the most respected members of Sam Houston's highly-respected criminal justice faculty, has been named a "regents' professor." The university's board of regents announced the honor during their recent meeting on campus. Now, Therefore, Be It Resolved on this 16 th day of August 2007 that Rolando V. del Carmen, Ph.D. be designated a Regents' Professor and forever hold said title, including all honors, rights and privileges appurtenant thereto.